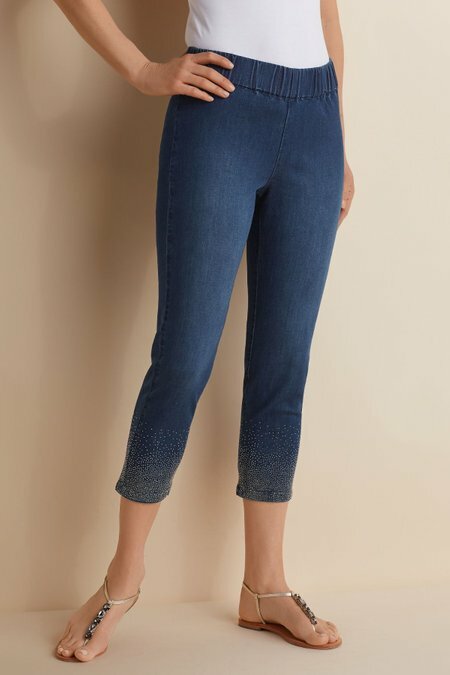 A generous splash of sparkling rhinestones reflects creative chic at the hems of our cropped denim pants. A wide, comfy pull-on elastic waistband holds in the middle and the slim leg flatters all. Super stretchy to recover quickly with no sag or bag. Brings dazzling shimmer to the day - or night. Misses 23" inseam. Sits at natural waist.